After a three-year hiatus, the Republic of Gamers returned to the PAX East show floor in Boston, MA. 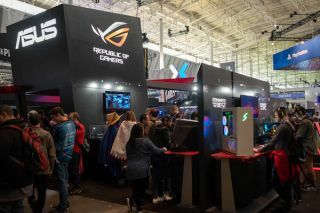 ROG made its presence known with a big booth in its signature black and red, game demos running on the latest ASUS ROG gaming hardware, and even an appearance from one of the most popular gaming personalities in the world, streamer Lirik. Along with a chance to fill up their wish lists for their next PC upgrade, PAX attendees were able to jump on the esports desk to try their shooter skills at Playerunknown's Battlegrounds, enter the virtual world of Super Hot VR, participate in 3v3 matches of Overwatch, and test out several custom gaming rigs on display. Players were also able to get their hands on the latest ROG gaming notebook, the Zephyrus M GM501, before it hit stores. The GM501 crams Intel’s latest Core i7-8750H CPU and an NVIDIA GeForce GTX 1070 GPU into a package that measures less than 0.8” thick and uses an innovative thermal solution to stay cool. When you open the GM501, a separate hinge opens up the back of the laptop for better airflow. The Zephyrus M was on show next to the ROG Strix GL12, a compact gaming desktop that’s built for esports players. Based on a factory-overclocked Core i7-8700K CPU and NVIDIA’s GeForce GTX 1080 GPU, it’s also got a hot-swap SSD bay that makes switching out drives a snap, and support for Aura Sync is on hand to ensure your rig matches the rest of your peripherals. All who visited the booth and completed multiple activities had a greater chance at winning the daily giveaway, which included the ROG Strix Flare keyboard, Gladius II Origin mouse, Scabbard desk mat Fusion 500 headset, and even an ROG Horsem4n figure, but what drew the most attention was the Intel-branded drop crate sitting at the edge of the booth space. In addition to serving as a backdrop for attendee photo ops, it was a part of ROG's exclusive #ROGWinnerWinner giveaway on social media. The winner of the contest received their very own Zephrus M gaming laptop and a mini crate to commemorate their victory. ROG has big things planned for PAX West, so don’t miss your chance to check out the latest gaming hardware when PAX hits Seattle later this year.